An American goldfinch perches on a chain that holds birdfeeders during a November 2018 snow storm in Danbury, Connecticut. The snow this week brought not only the unexpected visitors, such as fox sparrows, but also the regular visitors such as chickadees, nuthatches, titmice, doves, juncos, and woodpeckers. It also brought goldfinches, which was to be expected, but what was surprising was the number of goldfinches. Every perch on my thistle tube feeder was filled and other goldfinches either waited patiently nearby or “settled” for sunflower seeds at other feeders. There were even goldfinches on the ground among the many juncos. 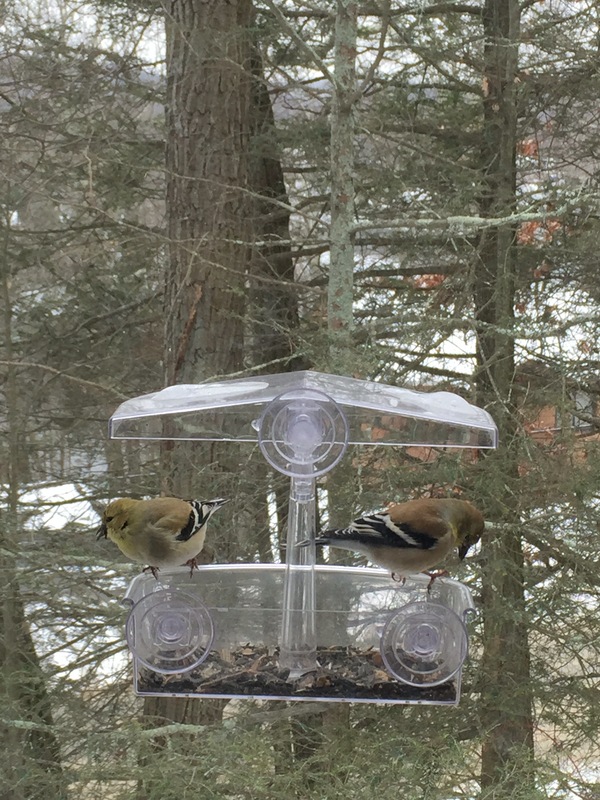 American goldfinches eat Nyjer seed from a tube feeder in Danbury, Conn., Nov. 2018. 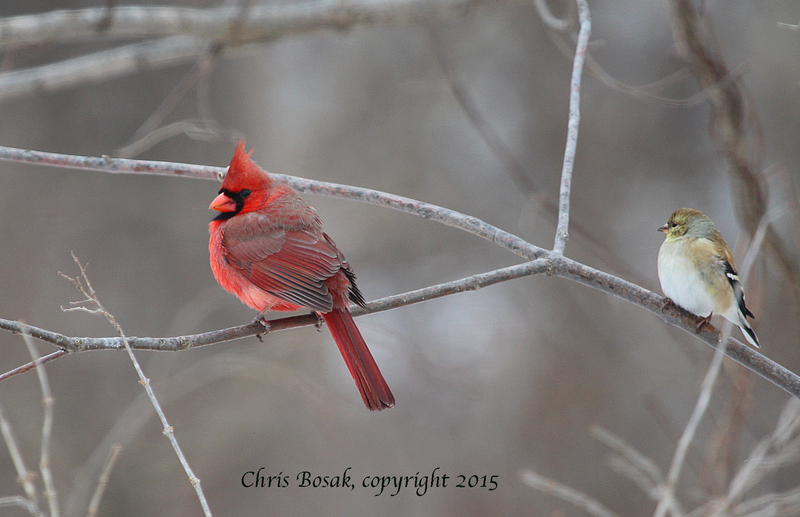 Here is the latest For the Birds column, which appears in several New England newspapers. 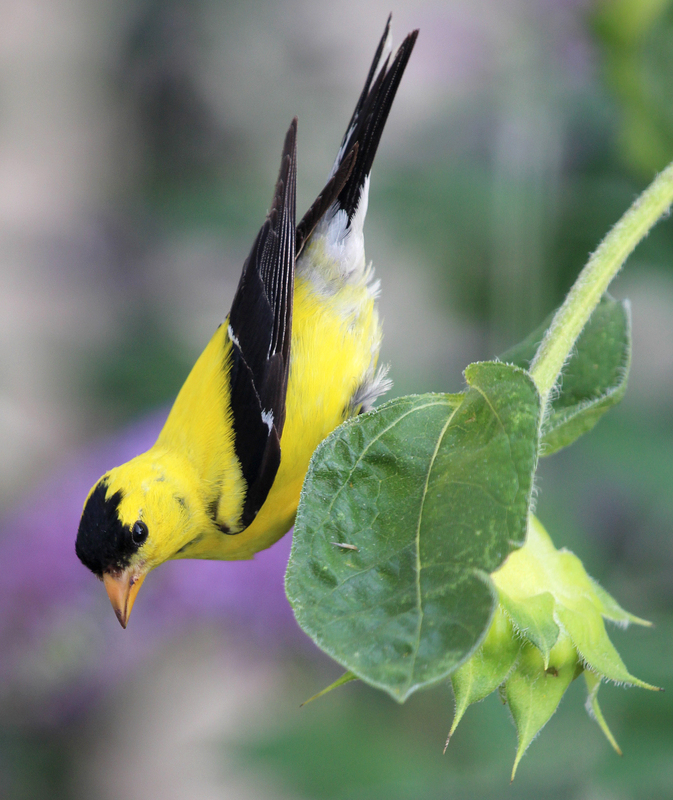 An American Goldfinch perches on a sunflower and picks out seeds in a New England garden. A large field grows next to the driveway of my son’s friend’s house. When I drop my son off, I always look there to see if anything is happening. Usually I don’t see much, except maybe a butterfly or a dragonfly or two from a good distance. But lately the field has been alive with activity, mostly from a familiar bird with a familiar song. Goldfinches are there — by the dozens. Three or four pop up from the tall grasses and sing their “potato chip” song as they fly in their undulating pattern to another spot in the field. This happens about every 15 seconds. So why all the goldfinches lately? Most of the other birds that nest in New England are relatively quiet when August rolls around. Other birds are largely done with nesting and tend to lay low as they raise their first-year broods. Goldfinches are different. They are late-nesters, especially by New England standards. While many birds time their nesting to coincide with insect hatches, goldfinches time their nesting to that of another food source: seeds. 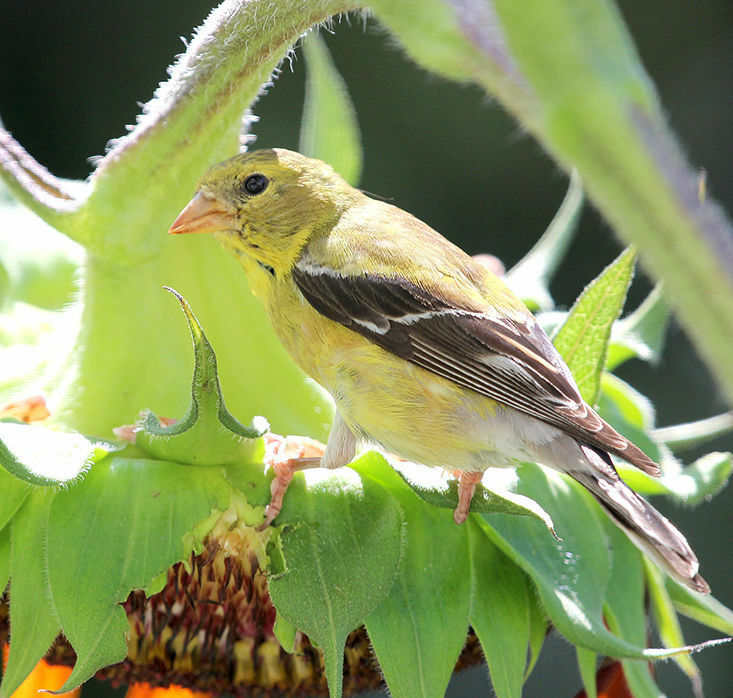 An American Goldfinch rests on a sunflower in New England. N othing cheers up a day like a goldfinch. Those little, bright bursts of yellow are always a welcome site at your feeder, bird bath or perched on a flower in your garden. I especially appreciate goldfinches in the dead of summer. I remember taking a walk a few years ago on one of those classic hot, humid days in August. It was the middle of the afternoon and, not surprisingly, I was finding very little in terms of wildlife. Dragonflies were dancing all over the place, but even the butterflies seemed to be hiding from the heat. Suddenly, I heard the cheerful song of a goldfinch in flight coming up from behind me. I turned just in time to see the bright yellow bird perch on the top of a thistle flower. The pink-and-purple flower rocked back and forth as it reacted to the weight of the tiny bird. When the flower settled, the goldfinch went about its business of picking at the flower. I watched the scene briefly, and continued my walk. About five minutes later, I heard the bird again. I looked up to see it fly over my head and disappear into the distance. Despite its tiny size — about 5 inches — the goldfinch is an easy bird to identify in flight. It flies quickly in an undulating fashion — like a roller coaster with small rises and falls — usually uttering its potato-chip, potato-chip song as it bounces up and down. I didn’t see any other birds on that walk, but the single goldfinch perched on the flower made it all worthwhile. Goldfinches also score points with me as they are frequently seen in my garden. I’ve seen goldfinches perched atop coneflower and black-eyed Susan flowers, picking away at the seeds. I’ve also seen them on sunflowers. Goldfinches, of course, are also reliable feeder birds, often occupying every perch of a tube feeder. I love to see all six perches of my blue tube feeder occupied by the bright yellow birds. Goldfinches will eat sunflower seeds and will visit platform or tube feeders. A sure way to attract goldfinches is to offer Nyjer in a tube feeder specifically designed for the tiny seeds. Do not try to use thistle seeds in a regular feeder as the tiny seeds will spill through the holes. “Sock” feeders stuffed with thistle seeds are a good alternative. Goldfinches visit feeders at any time of the day. It’s interesting to note that goldfinches move on frequently so the birds you see at your feeder in the evening are not likely the same ones you saw in the morning. Goldfinches are found throughout the country and many remain in New England through the winter months. They are not the flashy yellow birds we love so much in the summer, though. We still love them in the winter, of course, but they are much duller, often appearing olive or brownish. It’s fun to see the splotchy male goldfinches in the early part of spring as they slowly regain their bright yellow plumage. Only the males are bright yellow. Females are a duller yellow. They also have black caps and black wings with white stripes. My brother Ed and his wife, Debbie, are big Pittsburgh Steelers fans, so the goldfinch is a favorite in that household. Of course, you don’t have to be a Steelers fan to appreciate the beauty of a goldfinch. The bright yellow speaks for itself. Throw in a purple or pink flower and you’ve got real proof that Mother Nature likes her colors. An American Goldfinch eats Nyjer seeds from a frozen feeder during a frosty April 2016 morning in Danbury, Conn.
For the second day in a row the unpredictable New England weather provided an opportunity to get an interesting photo at the bird feeding station. Monday it was snow. Tuesday it was ice. 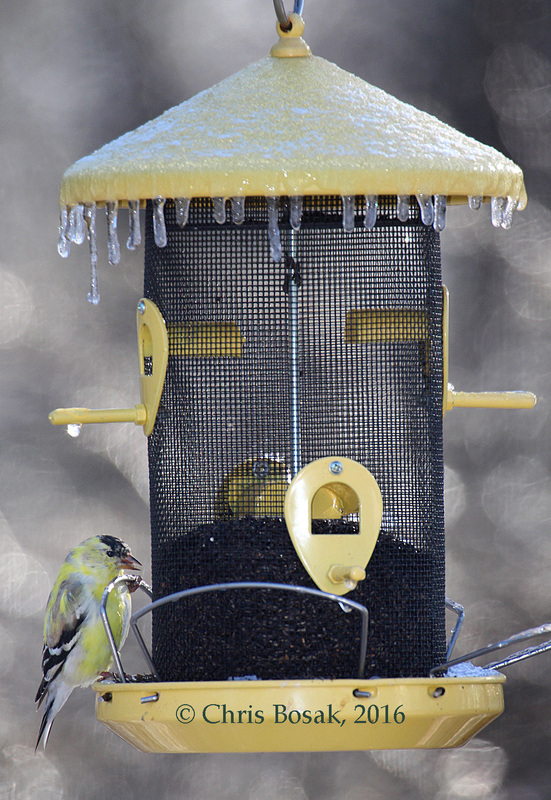 Here, an American Goldfinch visits the Nyjer feeder, undaunted by the ice and freezing temperatures. Notice that this male is transitioning into its breeding plumage. Below are a few more icy photos from Merganser Lake. 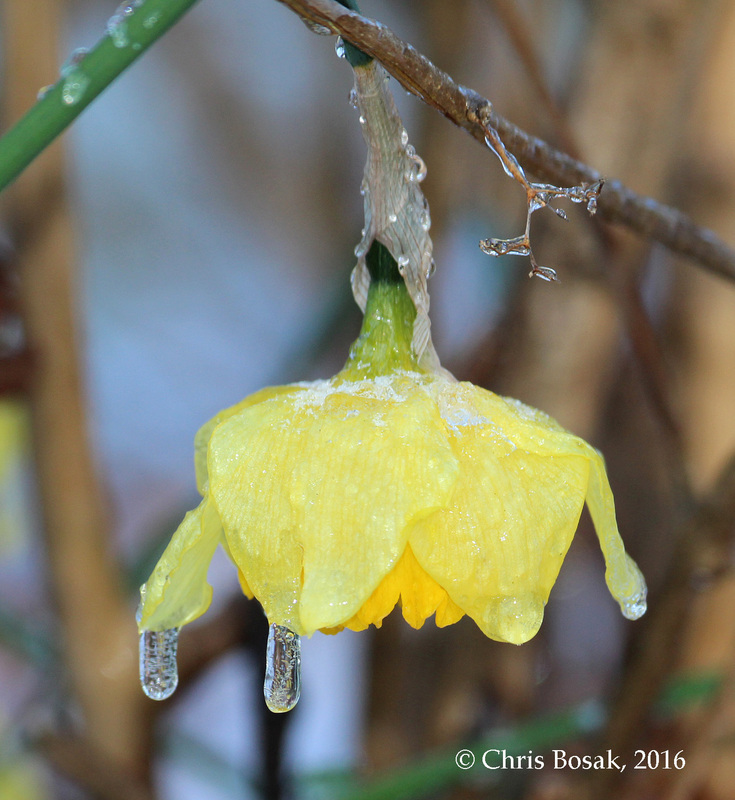 Ice covers a daffodil bloom in Fairfield County on a chilly Tuesday morning. 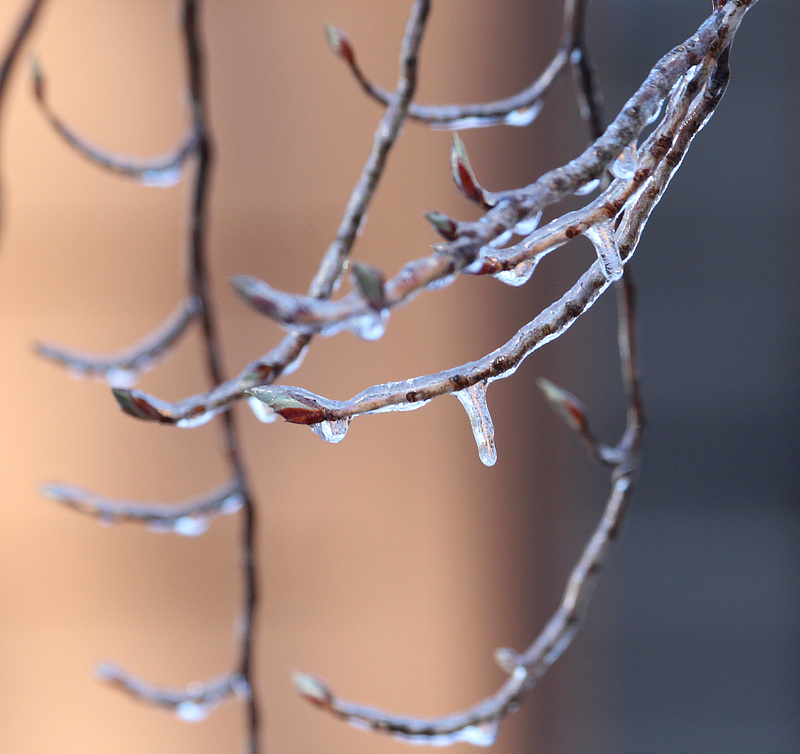 Ice covers the branches of a tree in Danbury, Conn., April 2016. American Goldfinch at window feeder. my desk are either titmice or chickadees. I love seeing them, but a little variety would be nice. How do birds know when a new feeder is out? An interesting question came my way via email the other day. It came from a long-time Norwalk resident who wondered how the goldfinches in her yard knew that she suddenly switched to Nyjer seed. She had never seen goldfinches before at her feeders, but when she put up a sock feeder filled with the small, black seeds, the goldfinches came within one day. Great question. As a quick aside, what is commonly referred to as thistle seed is really either niger or the trademarked name Nyjer seed.